Last updated on December 20, 2016 December 20, 2016 by Katie M Anderson for Armagard Ltd.
We’re coming to the end of 2016 and with the gift rush, Christmas outdoor digital signage is out in full force. Many of us have already started to think about our New Year’s resolutions, but for a lot of people, these resolutions will be along the lines of eating better, losing weight and saving money. 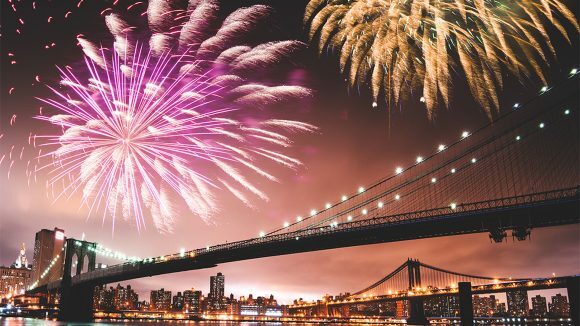 If you’re in business, you’ll probably be thinking about a different type of New Year’s resolution: concrete plans to grow and improve your business in 2017. New Year’s enhances aspirations for Professional and Business Developments. If you’d like to increase awareness of your brand, find more effective ways to share internal messages and boost sales, there’s an easy way to do this. Invest in a digital signage system, and you’ll be revolutionising your business’ communication methods and lifting your marketing efforts to a whole new plane. What is outdoor digital signage? Put simply, digital signage is an electronic display that shares content such as text, video, photos or animations. Screens like this are becoming more and more commonplace technology. Take a walk out of the office, and you’ll see screens sharing information in a large range of places. 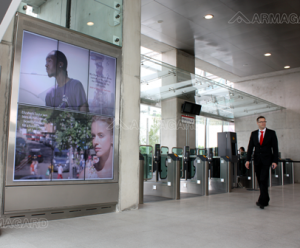 Train stations, shopping centres, corporate office buildings and even schools are coming to rely on outdoor digital signage to get their message heard. Over the festive season, this tends to go into overdrive. The increased number of shoppers create an opportunity for businesses to advertise to a much larger audience and boost their sales figures. Digital signage helps them to do this. Outdoor solutions are particularly helpful, as they can draw customers into shops, or even help to get them in the Christmas mood while shopping at outdoor markets. If your business hasn’t yet invested in digital signage, you’re missing out on all these opportunities. Make it your New Year’s resolution to increase your sales and marketing opportunities with digital signage in 2017. What are the benefits of outdoor digital signage? If your business or organisation has information to share, then a digital signage system is the ideal way to share it. Not only are these systems easy to install, they’re also extremely easy to maintain. You’ll no longer need to invest time and money in designing and printing new signage and marketing materials each season; instead you can update the information that is shared via your digital signage system in minutes. The software that comes with systems of this kind is really quick and easy to use, and will help you to streamline and simplify your marketing processes. In fact, digital signage content is so each easy to update and change that you don’t need to limit yourself to just one piece of content at once. Imagine being able to use your advertising space to display different marketing messages at different times of day! This would enable you to target specific groups of customers at different times and really maximise the potential of your advertising space. Digital Signage at London’s Emirates Cable Car Station | Armagard 2016. For businesses and organisations to succeed, it’s vital for them to build on their brand. Raising awareness and recognition of this brand is a key milestone. Digital signage is a very useful tool for doing this. Screens are much more eye-catching than traditional static signage, and they provide a much more engaging way to get your message across. Whether you want to share information about sales or promotions, or whether you want to raise awareness about the work you do – a digital signage system is a hugely effective way to do it. Of course, it goes almost without saying that increased brand awareness leads to an increase in sales. A tool that enables you to showcase and promote your products or services in a dynamic and engaging way will help to convince your customers to buy. Even better, why not get your customers involved? Many digital signage solutions come with a touch screen option. This means that your customers can really interact with the content on your screens. The possibilities this technology offers are almost endless: how about in-store ordering, customer feedback questionnaires or personalised product recommendations? Digital signage that’s used in an interactive way such as this could be collecting valuable customer data on your business’ behalf. Advertising this flexible is a very valuable commodity. Not only does a digital signage system enable you to react quickly to changes, it also helps you to engage with potential customers in a way that will really get their attention. Digital signage ensures that you’re getting a strong return on your investment for months and even years to come. Is digital signage important in industry? Digital signage is a valuable investment whether or not you work in a consumer focused environment. Screens can be used fir sales-focused purposes, as discussed above, but they can also be used for internal communications. Indoor and outdoor digital signage systems can be very useful within industry, as they provide a way to keep staff and engineers supplied with vital, up to the minute information. If you’re looking for an effective way to share corporate information and safety messages, you’ll find that a digital signage system is ideal. An LCD enclosure unit makes it easy to install screens throughout your premises: inside, outside and even in chemical plants. Enclosures will protect your screens from the work that is going on around them, while allowing easy viewing of the information that is being displayed. If you need to have the power to get information out quickly to your staff, then digital signage is going to become a very important part of your communication strategy. One of the easiest and most cost effective ways to get started with digital signage is to use an LCD enclosure. These pieces of kit can make any television or computer screen suitable for use outside, within industrial environments or within areas with extreme temperatures. Install your screen inside an enclosure, and it will be weather proof (Click Here For our Weather Protection Article! ), water proof, and secure from theft or physical impact. An Armagard 60” PDS Enclosure with Insulation Ready for the Outdoors| Armagard 2016. An LCD enclosure is a long term investment, as it can be used with different screens over time. This means that if you want to update your hardware, you can do so without needing to update the enclosure that’s protecting it. 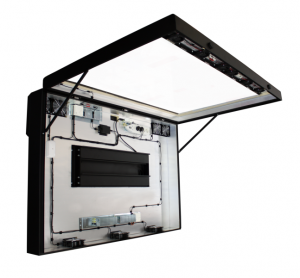 Screens may need to be swapped over time, but our LCD enclosures offer guaranteed longevity. All our enclosures come with a five year mechanical and one year electrical warranty: which means you can be confident in your investment. Armagard LCD enclosures are compatible with Micro PCs, Macs and HD/LCD/LED Televisions along with digital signage software. They also come with industry standard ratings that mean you can be assured of their quality. Our enclosures are rated to IP54, 56 and 65 standard, and NEMA4 and 4X standard. Digital technology is becoming more and more integral to business. Whether you work in a customer-focused sales environment, within a not for profit organisation, or within the industrial sector: now is the time to invest. A digital signage system will enable you to take control and streamline your communication and marketing processes. It will also help you to maximise the effectiveness of your advertising space by giving you the power to change information quickly and easily without the assistance of a graphic designer or printer. The benefits of digital signage are many and varied, and you can be confident that it will be advantageous for your business. A well utilised digital screen, whether used indoors or outdoors, will help you to create happier, better informed customers and staff. There are many ways to measure return on investment, and we believe that you will be very pleased with the positive changes digital signage will make within your organisation. Successful businesses tend to have one thing in common: they never stop moving forward. If you’re looking for a way to do this in 2017: we recommend joining the technological revolution and investing in outdoor digital signage. Need a Back Yard TV? Katie M Anderson is a writer, blogger and consultant based in York, UK. This entry is filed under digital signage. You can follow any responses to this entry through the RSS 2.0 feed. Both comments and pings are currently closed.